It's been a good week and I've had time to play!! YEAH!! I've been playing around with shadow stamping, but instead of doing two different color inks I used an embossing powder the second time. 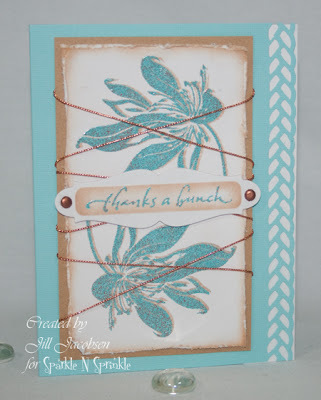 I stamped this Dotted Leaf Border from Sparkle N Sprinkle first with Memento Sand ink, then using the Stamp a ma Jig stamp a little off the first one with Versamark and embossed with Turquoise Nugget embossing powder...I love that color combo! 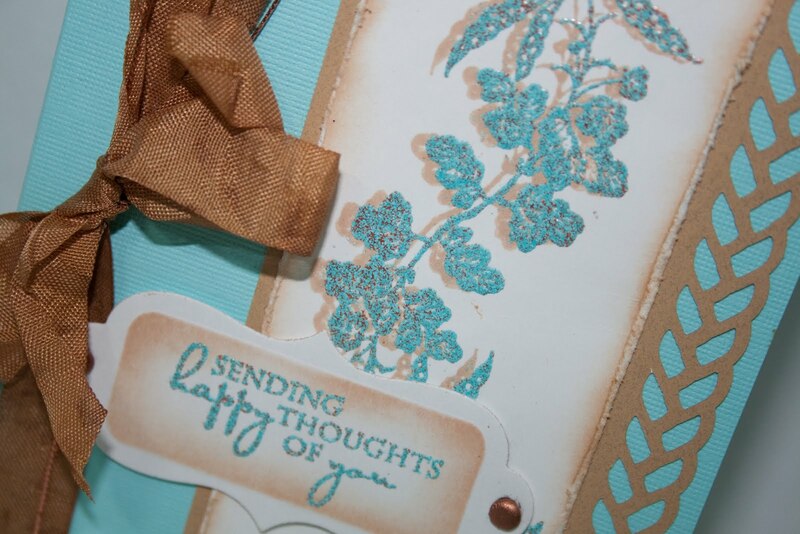 Then for the sentiment I embossed it and cut it out with Spellbinders Grommet Tags...the the ribbon, or white seam binding was colored with Copic marker E37. The brads where embossed with Copper EP to match the copper cording. beautiful cards....gave me great ideas.